This set of two bookcase piers is a functional, warm, and stylish addition to any bedroom. These bookcases feature an adjustable shelf and hinged cabinet doors for storage of accessories, photographs, and clothing in your bedroom, combining display space and storage space in the same unit. 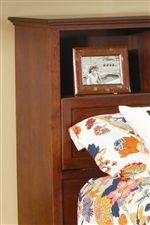 Use this set to bookend the bookcase headboard or simply as stand alone storage units. 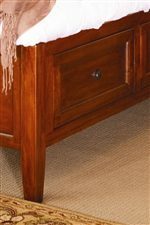 Match them with the coordinating dresser options for a homey and comfortable bedroom look that can't be beat. 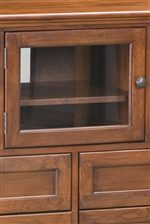 The McKenzie Bookcase Piers 2-Pack by Whittier Wood at Crowley Furniture & Mattress in the Kansas City Area: Liberty and Lee's Summit, MO & Overland Park, KS area. Product availability may vary. Contact us for the most current availability on this product.